This shoe is a great buy because it's a previous year's model, but it's a good shoe. This tour quality shoe, made of full-grain leather is very comfortable. It has Nike Power Platform, which gives you superb gripping traction. It has a Poron sock liner that adheres to the contours of your foot. It has a couple of really cool features that help keep your feet from tiring while walking. The heel plate has good gripping traction and keeps you steady when walking downhill. Plus, the Forefoot Flex Channel constantly adjusts your feet to the changing ground conditions. One word of caution: this shoe is not waterproof. It will keep your feet dry in light, dewy conditions, but not anything heavy, like rain and mud. 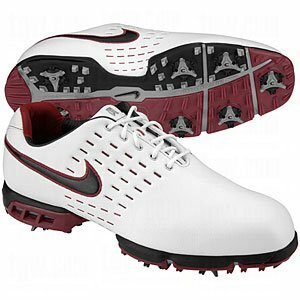 I would recommend this shoe to all golfers who want a tour quality shoe at a really good price.